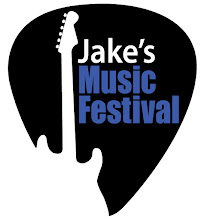 Jake's Music Festival is celebrating 10 years of great music for a great cause. We will have a limited quantity of commemorative t-shirts available for purchase at this year's event. Thanks to Jonny Logo for the design work. T-shirts can be purchased for $15 on the night of the show. That's April 12 in case you missed the memo. Jake's Music Festival t-shirt, featuring the name of every performer that has played during the past 10 years.